We were all once clueless about skincare — same goes for the Singaporean actress and now-ambassador for the skincare giant, Estée Lauder, Joanne Peh. Peh first made a name for herself when she clinched dual titles in the 2002 instalment of the beauty pageant, Miss Singapore Universe. Shortly after, she joined the local entertainment industry as an actress. She was 19 — a teenager with a bout of acne and milia seeds around her forehead. Peh’s fellow contestants brought her to the bathroom, showed her a concealer and started dabbing away at her face. “And that was the first time I put on concealer and knew that there was such a thing,” Peh continues. It was a wake up call for Peh as it made her realise that there was a world of beauty out there she had to quickly be acquainted with — and one which eventually proved vital for her acting career. Peh started with very simple products “like Hazeline Snow,” she recounts. Then she moved on to a three-stepped skincare regime, and tried to remedy her forehead outbreaks. All these came at a time when she started acting — so it became urgent that she had a clear complexion. When she came of age and moved into young adulthood, the hormonal breakouts tided over. Peh’s skin cleared up and she found herself with a normal, combination skin type. “The T-zone was oily and I had combination skin, that was about it,” says Peh. For the local actress-turned-director, Joanne Peh, she moved from a clueless and acne-stricken teenager to the ambassador of the beauty giant, Estée Lauder. Photograph by Sng Ler Jun. Later in her acting career, Peh ventured into luxury skincare. “He knew more about skincare than I did,” Peh admits in hindsight. In that luggage of products was a brown bottle, Estée Lauder’s Advanced Night Repair serum. Peh remembers the distinct look of that bottle. 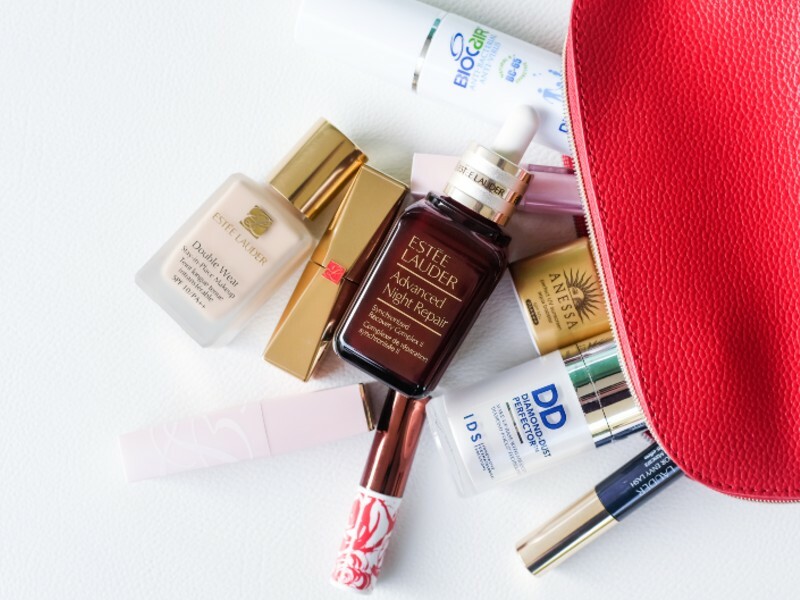 A glimpse into Joanne Peh’s vanity bag — amidst a Biocair hand disinfectant (S$14.80), the Japanese sunscreen brand, Anessa’s perfect UV sunscreen mild milk (S$39.90), and IDS’s Diamond-Dust Perfector Makeup Base (S$65) is Estée Lauder’s Advanced Night Repair (S$81). Photograph by Sng Ler Jun. Today, Peh’s skincare regime is minimal yet rigorous. “Ever since I came to understand skincare, I’ve actually been very diligent,” says Peh. Although she has a morning and evening routine, there are two things that Peh swears by — post-shower skincare and proper cleansing. “I always do skincare after a shower, so the pores are still open and the skin can absorb the products,” says Peh. “And I cleanse thoroughly.” She reiterates that she has “never, ever” gone to bed with makeup on her face. It’s been 17 years since Peh stepped into that pageant audition and had her first encounter with skincare and makeup. Her skincare journey has come a long way — and with it, her self-esteem and confidence too.